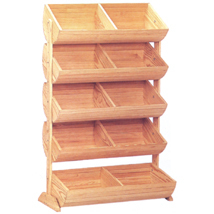 The Wood Barrel Display includes four roomy barrels angled for optimal product display. Display is made out of a solid pine construction. Display has 5 barrels with dividers for a total of 10 display areas. Some assembly required.